Please provide us with the best email address in the event we need to send information to you. Place straightedge across the flange surface and extend aft until it makes contact with the transom, also mark transom at bottom of straight edge. Record the distance from the center of the exhaust flange to the mark on transom. From the mark on the transom, measure up or down to the center of the Exhaust hole. If the hole is above your mark, enter a “+” sign and if below use a “–“ sign, in the next field. If the hole was above your mark, select the “+” sign or if below select the “–“ sign. Measure up from the manifold exhaust flange to any obstacle, or the bottom Of the engine hatch. Measure center to center of exhaust holes in the transom. 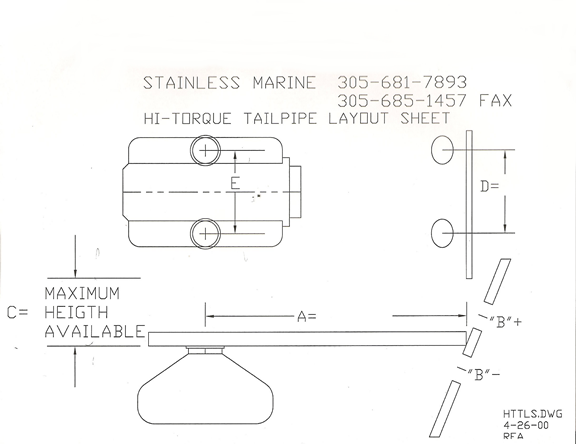 Were measurements taken with Stainless Marine Hi-Torque Manifolds?